An interdisciplinary body of knowledge and field of research, concerned with how formal organizations, behaviour of people within organizations, and salient features of their context and environment, evolve and take shape, why all these things happen the way they do, and what purposes they serve. 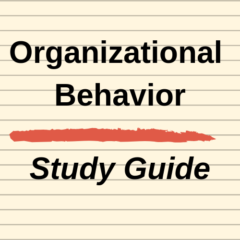 When looking at definitions for organisational behaviour, we should also really look at the definition of organisation, as this will give us a better understanding of the above, so, what is the definition of an organisation? Work organization: a deliberately formed social group in which people, technology and resources are deliberately coordinated through formalized roles and relationships to achieve a division of labour designed to attain a specific set of objectives efficiently. Organization: a social arrangement for achieving controlled performance in pursuit of collective goals.